We all went through it before – it’s the horrible feeling of being constipated. In cats, this issue is solvable once you discover the cause as it can be either medical or behavioral. In this article, we will look at several facts that might help cat parents if their precious feline companions are having problems with their digestion. First of all, we need to establish something. Constipation can’t be considered a disease per se; it is a symptom or rather, a clinical manifestation. In many cases, and in many cats, it is caused by dehydration. Unfortunately, cats do not love drinking water as much as dogs do, and that’s why they will consume small amounts throughout the day. If you have cleaned a litter box before, you probably know that cats have naturally hard stools, especially when compared to dogs. That’s because most of the water that gets inside the intestines is resorbed, which means that the stool becomes even drier. Other things that cause constipation can be mechanical or functional (such as a foreign body that your cat has swallowed, for example, and that now blocks the transit or a mass that has grown inside the intestine), but they can also be behavioral or can pertain to changes in the cat’s living environment. If, for instance, you have recently moved, your feline buddy might not be used to using the litter box in its new location. Furthermore, cats whose pet parents don’t clean their litter boxes regularly become stressed and will knowingly refrain from ‘going to the bathroom’ for number 2 if the ‘toilet’ is dirty. Constipation can also be caused by some drugs (anesthetics), trauma, arthritis, or any kind of pain or nerve damage that makes it painful for the cat to defecate. Lack of exercise is another culprit, and that usually causes constipation issues in older cats. Healthy cats usually defecate once a day. I wanted to get that out of the way so that you know what to expect if you’ve never had a cat, for example, and you’re wondering what the normal frequency of defecation should be in a cat. Naturally, this frequency can depend on what you feed your cat, how much she eats, her age, her health, and a variety of factors. Nonetheless, a cat that is a completely healthy adult will usually defecate once per day, every day. Some of the classic constipation signs that you might notice range from small quantities of feces to infrequent or the absence of defecation. If you happen to be around the litter box as your cat is tending to her business, you might notice that she is straining to defecate. 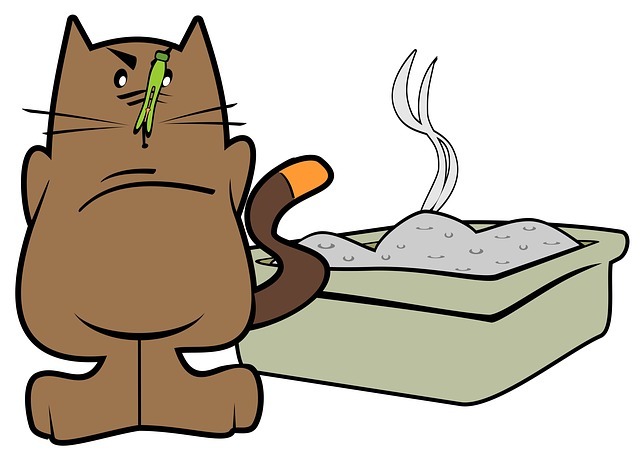 The feces are always dry, and while it might be difficult for you to tell if they are harder than the usual (especially since all cats’ stools are hard), sometimes you can tell by how sound — like you’re using the poop scooper to gather rocks instead of feces. Other clinical signs that might be discernible are lack of appetite (naturally, your cat’s digestive system is full enough, so there isn’t enough room for the new food), depression, and very small amounts of liquid stool containing blood or mucus. Sometimes, the cat might try to tell you that something is wrong, and since she can’t be as communicative as a dog, she might defecate a small amount next to the litter box. If you suspect that your cat is constipated and your pet’s annual checkup date is getting closer, it might be a good idea to take your feline companion to the vet – just in case. The treatment can vary depending on the severity of the condition. Veterinarians could supplement your cat’s diet with healthy fiber, such as pumpkin, for example. In some cases, oral medication might be necessary – laxatives, stool softeners, and motility modifiers. Sometimes, constipation can be associated with other underlying diseases, such as kidney conditions, which might be at the root of the dehydration. It’s very challenging for cat parents to do this, but getting their pets to drink more water can actually solve part of the problem. My cat drinks a surprisingly big amount (like ⅓ to ½ a small bowl per day), and to be honest, I was quite surprised and even a little alarmed because of that when I adopted her. She doesn’t have any other symptoms of any kind, however, and she’s always consumed a little more water than the typical cat – and that’s good for her, actually. In many cases of constipation, fluid therapy can be of great help. In situations where the constipation is a little more severe, an enema might be necessary to manually remove the feces. Believe me when I say that it’s not a pleasant experience neither for the pet nor for the veterinarian to go through this procedure without the cat having taken a mild sedative. The truth is that some cats can be so constipated and so old (and their blood and serum tests have such poor results) that the enema should be performed without sedation (or with a very, very mild one), and that’s because sedatives can be a little dangerous for old pets. Although it happens more rarely in cats than in other species, even they can suffer from megacolon, which is basically the size increase of the colon because of a very severe case of constipation (chronic constipation causes it more frequently). If this does occur, the treatment is surgical, so the veterinarian has to remove parts of the colon, but at least your cat’s life will be saved. Back in the day, when I was a kid, we had a male cat that (we thought) would get constipated. In actuality, he would use my grandfather’s fishing shoes as a toilet, and we tried everything and anything to get the cat to use the litter box. We even fed him cooking oil using a syringe. I personally don’t recommend doing that with your cat, especially if it’s plain canola oil – it’s heavily processed and pretty much good for nothing. However, one thing that does seem to work is coconut oil. Apparently, cat constipation coconut oil can be a remedy, along with feeding your feline companion small amounts of fiber coming from sources such as pumpkin, and an occasional natural laxative like aloe vera juice. Mind you, not the aloe vera juice that we drink and that’s available at any store – the actual aloe vera juice extracted from the plant and with zero artificial colors and sweeteners is the healthy alternative. Can I give my cat Miralax for constipation? Yes, you can use Miralax as a stool softener in cats, but you should never do it every day. From what I found, the correct dosage is around a fourth of a teaspoon per day – that is, if the cat is an adult. It’s difficult to convince your cat to drink more water, especially if she isn’t in the habit of doing that. Most cats love wet food more than dry food, though, and that might be a good option if you want to keep your feline buddy well-hydrated. Don’t replace the dry food with canned food all at once – rather try to maintain a balance between the two. Even if you are super tired after a whole day’s work, you need to find a little time to have fun with your cat, especially if she’s playful. On the one hand, this helps you build a bond with her, and on the other, it gives her the opportunity to get a bit of exercise, and exercise is always great for intestinal motility. Another piece of advice that I can give you is that, if you are the pet parent of an old cat who is known to suffer from arthritis, you should never miss giving her medication for pain. If she gets pain relief, she might find it less difficult to defecate and she won’t ‘hold it in’ for so long that it leads to constipation. Last, but not least, I would personally recommend getting pet insurance, because even a somewhat less ‘complicated’ procedure like an enema can cost you a lot of money if you have no insurance and take your cat to the vet. Needless to say, surgery can throw you into debt – again, if you have no pet insurance. If you enjoyed this post, maybe you’d like to find out more about eye infections and how they can affect cats.